Local culture is the result of civilization created and accumulated by specific nationalities in historical practice activities, and is an important condition for the survival and development of national communities. In contrast to foreign culture, it refers to the mother culture; as far as modern culture is concerned, it refers to the culture passed down in history. It is also manifested in material carriers such as architecture, sculpture, production tools, daily necessities, or in the accumulation and storage of various kinds of knowledge and information. Before the birth of the script, human beings began to use graphic symbols to express their feelings. The pottery patterns of the Neolithic Age and the rock carvings carved on the cliffs all recorded the human understanding and understanding of the natural world, and they Inner hope and expectation. These figures have evolved over time, changes in history, and the continuous evolution of science and technology, materials and crafts, as well as the continuous extension and evolution of foreign cultures, which have formed a unique Chinese plastic art system. This plastic art system embodies the wisdom of the Chinese nation for thousands of years, and also inherits the unique artistic spirit of the Chinese nation. In Chinaâ€™s rich treasures of modeling art, early pottery supplies, bronze wares, porcelains, jades, furniture from the Song, Yuan, Ming, and Qing dynasties, etc. We can study and discover our localized aesthetic ideas of creation. China's practical creation aesthetics. It encompasses the sensibility of form beauty (shape, proportion, color) in the aesthetic process and the dual aesthetic element of functional beauty (indicative, symbolic) in the process of use, and is the unity of subjectivity and objectivity in beauty, such as China. The traditional â€œthree devices are suitable for beauty and attitude.â€ The three devices are pottery, bronze ware, and porcelain. In the era of painted pottery, people sit on the floor and do not use tables and chairs. The viewing point of the objects is relatively low. Therefore, the decoration of the objects surrounds the edges of the mouth of the device. People's artistic feelings (mainly visual and tactile) in practical production and use make the device form a natural life form, see the smoothness of the line surface in stillness, and make the modeling and decoration lining up the life activities of people. , In the appearance of the rhythm of the operation, so as to show the beauty of rhythm in different fits and postures. China's traditional arts and crafts are very rich in decoration techniques. While paying attention to natural materials, ancient craftsmen also pursue the beauty of workmanship. The furniture of the Ming and Qing Dynasties inherited and borrowed the ancient art of pottery, the magnificent bronze art, the majestic architectural art, and the elegant ceramic art. In the structural decoration,. The use of stitching is the principle of the application of traditional furniture special localization modeling language in modern design. In the field of product design, tradition and innovation are like parents and children. In the new design, you can always see something similar to the previous design part. This can be seen as genetic inheritance, and the difference between the new design and the previous design is mainly due to the combination of tradition and personal creativity, as well as under the context of the new environment. Natural selection (natural selection) adaptability. Inheritance tradition is the process of re-selection and rediscovery. Again. "Editors" of traditional language and details, quoted the ideal symbolic recognition, has always been the designer's pursuit of new styling. Through the historical extension of traditional plastic art, we can see that the plastic art itself is an open system. Under the impact of new technologies and concepts, they are continuously updated and expanded, and the subsequent connotations and spirits are the result of the long-term accumulation of ethnic history, are unique to the Chinese nation, and are the soul of the national form. In order to create a new national form, China's traditional plastic arts should be extended and developed in modern design. It should be based on understanding to take its â€œformâ€ and extend its â€œideaâ€ so as to transmit its â€œgodâ€. Naturally, it is not simply copying and copying, but the recreating of traditional forms.On the basis of understanding, this kind of re-creation is based on the understanding of modern aesthetic concepts to transform, refine, and apply some elements in traditional forms. Rich in the characteristics of the era; or applying the styling methods and expressions of traditional styling to modern design to express the design concept, but also Now national character ridicule. Many visual images with Chinese cultural characteristics (such as Tai Chi diagrams, traditional auspicious patterns, etc.) and artifact modeling elements (such as Chinese knots, mahjong, and living utensils, etc.) can be well applied and refined in modern product design. In particular, in the application of graphic culture graphics, it is not possible to simply perform a three-dimensional stretching process at a given height on a two-dimensional basis. The resulting three-dimensional shape is often unable to stand up to multiple angles of view and should be combined with products. Use requirements, product material processes, and aesthetic requirements to design comprehensively. 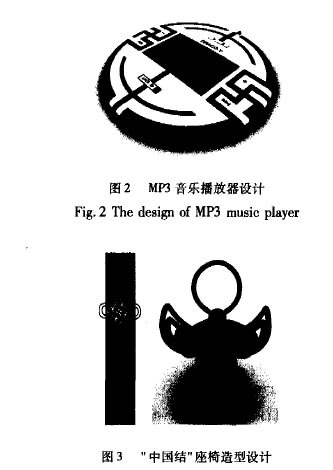 Such as the author guides student curriculum design work: MP3 music player design (see Figure 2) and Chinese knot seat design (Figure 3). In the information age where the economy and culture are increasingly integrated globally, inheriting and promoting local culture and promoting the application of localized languages â€‹â€‹in modern design are the consumer demands and cultural trends of the times. The innovation of design and the inheritance of traditional culture should be the re-creation of traditional forms and the process of re-selection and rediscovery. With modern aesthetics, some elements in traditional forms are refined and renewed. Editing, or applying the modeling methods and expressions of traditional modeling to modern design, creates new models that conform to the aesthetic concepts of the times and regional characteristics, highlighting the regional values â€‹â€‹of design. The research on the application of local culture in modern design is an important, systematic, and dynamic research topic. This article aims to attract valuable comments and attract the attention and research of the industry. Business card Offset Printing Machine is a kind of offset Printing Machine, mainly for business cards, tags, cards and other small size printing, so the design of the machine is small, easy to operate, very suitable for some small stores. The printing principle of the machine is the same as that of the offset press. The main difference is the size range of offset printing. This machine should be in accordance with the printer, such as using UV printing, UV machine must also be equipped with drying. Supporting equipment in addition to UV dryer, according to the business card process requirements, matching cards, bronzing machines, cutting machines, etc..